Williams A.O. 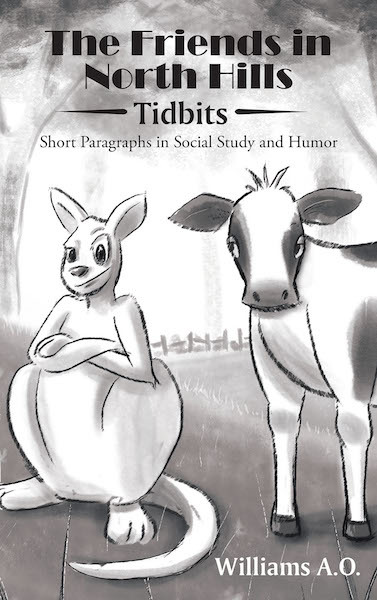 's New Book, "The Friends in North Hills, Tidbits: Short Paragraphs in Social Study and Humor" is a Purposeful Read Designed to Teach Young Adults Morals and Social Etiquettes. Recent release "The Friends in North Hills, Tidbits: Short Paragraphs in Social Study and Humor" from Covenant Books author Williams A.O. is an acerbic and thought-provoking narrative that conveys lessons on proper conduct and demeanor for teenagers. Glenside, PA, November 7, 2018	(Newswire.com) - Williams A.O., a pharmacist at a community pharmacy in the USA with professional experiences in retail, long-term care and hospital outpatient practice; and a Merit Award Winner (MAW) of the Pharmaceutical Society of Nigeria (PSN) Lagos State, has completed his new book, “The Friends in North Hills, Tidbits: Short Paragraphs in Social Study and Humor”: a prolific read that delves into the notions of proper decorum for teenagers, criticisms on misbehavior, and solutions for improving the quality of teenagers’ standards. Published by Covenant Books of Murrells Inlet, South Carolina, Williams A.O.’s new book presents a unique way of imparting its virtues to eager individuals seeking to improve their lifestyles and characters. An amusing and masterful opus, this book features a collection of short stories with lessons to ponder upon and internalize in the hopes of improving manners and dignity. Readers can purchase “The Friends in North Hills, Tidbits: Short Paragraphs in Social Study and Humor” at bookstores everywhere, or online at the Apple iTunes store, Amazon, or Barnes and Noble. Tags: "The Friends in North Hills, Covenant Books, Tidbits: Short Paragraphs in Social Study and Humor", Williams A.O.